Mr Tubby Ltd - The Venus Model Hot Tub/Spa. 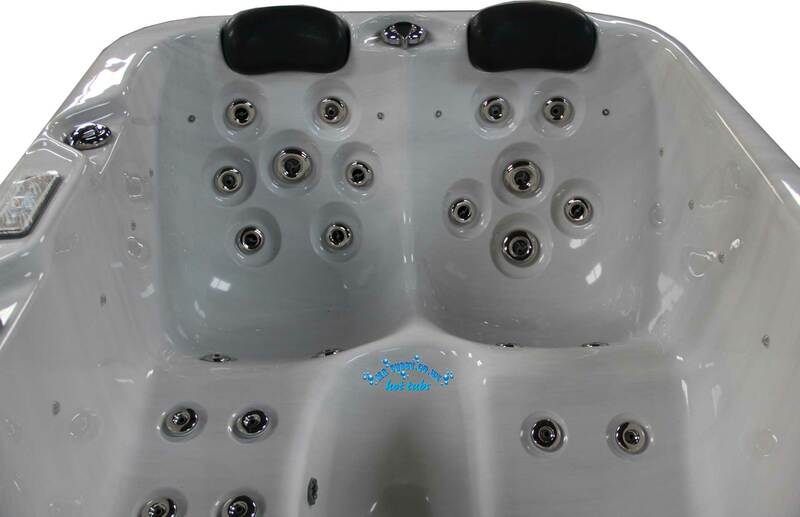 A brand new 2018 model - 184cm, 2 person, 2 loungers, 2 pumps and 30 chrome hydro jets for the ultimate hydrotherapy experience. Comes with Waterline LED light's, BALBOA USA luxury programmable control system inc. waterproof MP3 input, plus durawood surround. CHOOSE YOUR PACKAGE! - Pick it up, or have the spa delivered and fully installed including the final electrical connection by our spa engineer - its up to you! This Mr Tubby Venus hot tub colour is LUCITE White Marble. The exact colour and spa that can been seen in the pictures below. All listed items are in stock for immediate delivery, they have been uncrated, quality inspected and totally wet tested. 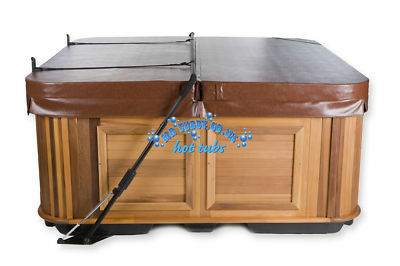 We are a UK Ltd Hot Tub company and a business seller on Ebay. Please see below for company number and VAT registration, including both land line & mobile customer support telephone numbers and business address. To date we have NEVER just carried out a 'KERBSIDE' delivery as we are a specialist installation company, although we have now broken the costs down as some ebay customers prefer to see this when comparing companies. If you do decide on Mr Tubby's kerbside only package, remember your Spa will have been quality inspected and wet tested prior to being delivered to you on a specialist Spa Delivery system. When comparing companies who offer a "kerbside" option, please check that you are not simply taking delivery of the 'shipped crate', having never been inspected or wet tested? Inspecting a crate for quality & damage to the hot tub is not possible, then there's moving the 7/8ft square crate weighing 300+ kg's to its final destination! If the spa does not work quite right when you wire it up then run it, who's fault is it? - the installer/electrician (YOU), the shipper, or the manufacturer?. Will the warranty still be valid? Delivery of the spa to your address and offloading. The spa will be shrink wrapped for protection. Technical overview of the spa components (should you ever have an issue with a spa, it helps diagnose the problem over the phone) e.g. pumps, ozone unit, chlorine feeder system, lights, heating system, main control panel, filtration system. Ongoing maintenance discussion of your new spa. YOUR HOT TUB IS THEN HEATING UP AND YOU WILL BE IN IT THE SAME DAY! Total power jets - 30 Hydro Chrome Jets (a quality selection of hydro jets featuring on/off selection, rotary and directional jets). Many hot tubs are installed with either a small footwell light or LED light therefore making the evening experience within the spa dull! There are current spas being sold with an LED main light and 20 waterline lights BUT they only have one mode and change colour - red/green/blue constantly driving you mad! We install the market leading spa lighting system that includes a 60 LED 5inch master light with 20 LED waterline lights. All of these lights are in synchronisation with each other with an array of different light colours and modes making the evening hot tub experience one to remember! Simply turn the lights on/off to scroll through the colour and modes. Designed to take either standard pleated paper filter cartridges or the micron filters with an inbuilt antibacterial layer. More information on request. Balboa USA Programmable Control System - waterproof cd/mp3 player input, discrete black stereo marine speakers. There are many reasons why Lucite® cast acrylic is superior to any other material for making quality spas and hot tubs. From color selection, durability and safety to sheer, sparkling beauty, Lucite® delivers the greatest possible value in spa living. A hot tub spa is a wonderful investment in your personal well-being. The soothing warmth of the bubbling water eases away tensions and stress. Hot tub spas made with Lucite® cast acrylic have always been the easiest to clean. Now Lucite International has taken Lucite® acrylic surfaces to the next level by incorporating Microban® antimicrobial product protection which inhibits the growth of bacteria that can cause odor, stains and product degradation. And Microban® won't wear off with time because it's actually built in the hot tub spa's surface. What does this mean to the hot tub or spa owner? While most people are careful about water maintenance, many do not think about the surface area above the water line. Buying a hot tub or spa made from Lucite® cast acrylic with Microban® allows the owner to truly relax and enjoy the investment. Microban® antimicrobial product protection is used in products throughout the home. From toothbrushes to cutting boards, pillows and socks, to furnace filters, there are a number of products offering this extra protection. Balboa - on - board, what does this mean? 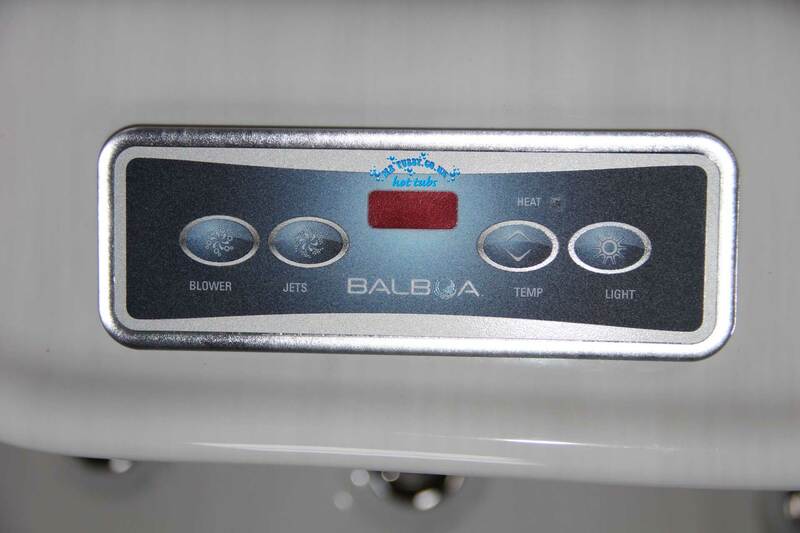 All of our spas are specified with the leading American spa control system from Balboa. Should you wish to view this spa at the Mr Tubby warehouse (located near Shrewsbury, Shropshire) please call for an appointment. 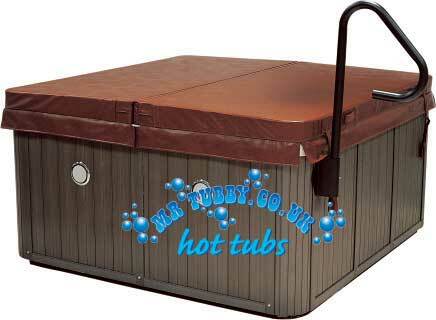 Every hot tub installed by Mr Tubby will be left in a perfect working condition for you to use immediately. Once installed all hot tubs carry a manufacturers one year (with exception of the structure that carries a 2 year) parts only warranty, providing all manufacturers assembly, care and maintenance instructions are strictly adhered to. This warranty excludes accessories including insulated cover, cover lifter and spa steps. Although unusual, should you experience any problems with your hot tub Mr Tubby will arrange all replacements parts. We will endeavour to reply to you within 48 hours and inform you of what action will be taken. At Mr Tubby we have over 20 years of engineering experience therefore should you ever come across an issue with your hot tub, most are solved via the phone, one to one with a spa service engineer (not an importer!) Should you require further assistence then your local hot tub specialist or Mr Tubby can solve via a site visit. All spares are held at the Mr Tubby premises to ensure continual use of your valued hot tub. On hot tub sales, a 10% deposit is required, then the balance must be paid prior to delivery/collection. Contact us for payment methods available. If Payment is to be made by personal cheque, then we require payment ten days prior to delivery. All cheques should be made payable to ‘Mr Tubby Ltd’. All prices shown include Value Added Tax (VAT) at the statutory rate current at the date of invoice. No property in or title to the goods shall pass from the company to the customer unless and until the customer has made full and complete payment to the company. There may be certain restrictions and/or requirements that are particular to your locality. If in doubt, check with your local Council. Security regarding young children, are they in view when using the Hot Tub? How close to where you change or disrobe? Where is the sunny position, what time of day? Avoid overlooked locations therefore creating privacy. Shelter from prevailing winds as this can result in lower operating and maintenance costs. Where is the electrical supply run from that is required for the Hot Tub supply? How do you run the cable to bury it? Where is the hose to fill and drain the Hot Tub? Where to drain the water to? 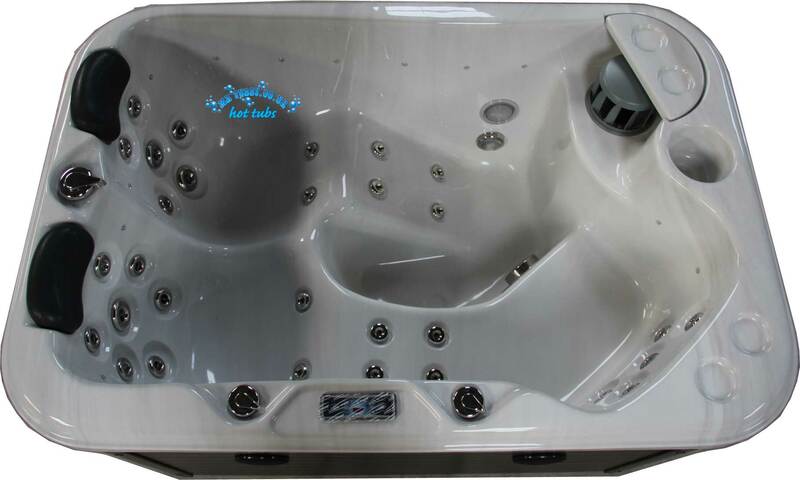 Year round suitability of the Hot Tub hard standing surface and its maintenance. Is your selected spot accessible, therefore will the Hot Tub go through on the delivery trolley? What view do you want to enjoy from the Hot Tub? What ground works are required for a solid, level base? Its ideal to allow 1 metre clearance for access to the Hot Tubs access panels, for servicing (but sometimes not realistic! Therefore 40cm is sufficient to get access for inspection and minor works. If less than this clearance then worst case is that in the future should you need access to a particular side then you will have to drain down, and push the tub over). The site you select for your Hot Tub MUST be a flat, level, continuous surface that contacts the bottom of your Hot Tub fully. Your new Hot Tub weighs between 1900 and 3500 KGs (according to model) when full plus the weight of 6/7 persons and therefore a solid support is essential. A 10 to 15cm thick reinforced concrete slab is ideal but not necessarily required. In most cases your Hot Tub can be mounted on existing patios which have adequate foundations for the Hot Tub loading. If in doubt consult an expert. It is recommended that you install your Hot Tub at ground level, which allows easy access to equipment. The base should be at least the size of the overall Hot Tub - see sizes on the technical data sheets. Note - If preparing a new location it may be worth extending the hard standing around your Hot Tub. This will allow good access for both maintenance and person entry, plus avoiding soil splash from water coming over the Hot Tub edge. Also, you may want to purchase a gazebo that also requires a level hard standing. Select an anti-slip surface for wet feet. Needs to be a durable waterproof finish. Avoid over hanging foliage that causes algae on the Hot Tub cover and makes the hard standing slippery. The Hot Tub will arrive as a unit and cannot be dismantled. 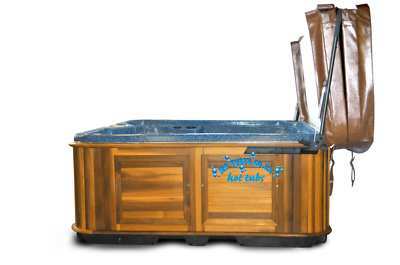 Ideally the Hot Tubs will be placed on a special trolley either on its side or on its base. Take note of the your Hot Tub dimensions and make sure to add these to the relevant height, width and length of the trolley it will be transported on (see diagram below). Soft ground, gradients or one or two steps must be ramped and boarded out by the buyer prior to delivery. It is very difficult to manoeuvre the Hot Tub up or down long flights of steps. If steps are involved please contact Mr Tubby Ltd for further advice. Ensure there is sufficient width throughout the route, considering any gateways and all turns especially right angles. The Hot Tub on its trolley must be able to get around these. Walk the route with a tape measure and check that any protrusions or height restrictions will not effect the route taken by the Hot Tub and trolley. Beware of central heating vents and ducts, electric/gas meter housings, rainwater gutters and soil downpipes, low branches and foliage. If installation cannot be achieved via the specialist trolley system then either yourself or Mr Tubby Ltd can arrange for a crane lift of the Hot Tub into your required location at extra cost. Call for advice. 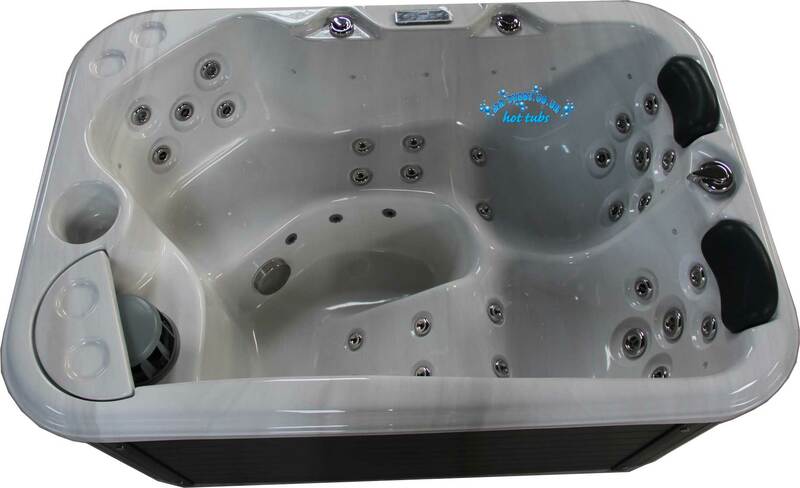 All Hot Tubs require a dedicated 240 volt, RCD protected electrical circuit that is permanently hard wired to the mains supply. Check the spa specification regarding the power (e.g. 32 amp, 45 amp supply). At the site where the Hot Tub is to be located, a local isolator must be placed 2 metres away from the Hot Tub. 5 metres of cable should then be left for the final connection of the Hot Tub. All electrical wiring to a Hot Tub MUST be installed by a qualified, licensed electrician and approved by local building/electrical inspectors or by a qualified ‘Part P’ approved company. Mr Tubby Ltd has ‘Part P’ approved electrical engineers to carry out all electrical services, please call to discuss your requirements. Note - This could be in the form of total installation, or maybe the buyer laying and burying the cable whilst building the hard standing, then Mr Tubby installing the RCD, local isolator, making all connections and relevant testing and certifications. Water should always drain away from the Hot Tub. DO NOT locate your Hot Tub in a low run-off area since rain or melting snow could flood the area and cause pump and equipment damage. DO NOT locate your Hot Tub near or under overhead cables, and clear of all electrical appliances.